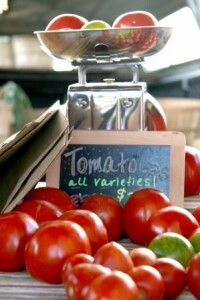 at the market this Saturday… tomatoes and more! We will be at the New Albany Farmer’s Market this Saturday morning, summer hours have begun 8:00-12:30. Be sure and stop by for your weekly fresh produce. 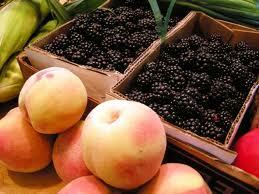 On the tables this week you will find… tomatoes, corn and peaches!!! also… cabbage, cauliflower, a few peas, beets, new potatoes, green beans, zucchini, yellow squash, kale, cucumbers, bell peppers, Swiss chard, more green onions, fresh cut basil, mint and CANDY onions. Kenny thinks he’ll be picking a new batch of sugar snap peas too. Blackberries are ready for picking, we should have some… along with more blueberries. Peaches will be available… this will be the first picking and they are semi-cling variety. Our weekly baskets are now available, be sure and pre-order by NOON Friday. The chickens are loving this weather and are producing well, they are giving us plenty of eggs to bring to market. But like with all good things they sell out fairly early too. Just a reminder, we have our homemade preserved items available each week as well.